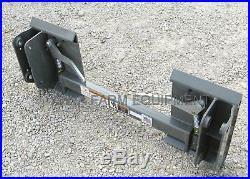 IFE' Skid Steer Quick Attach Adapter For The Following Ford/New Holland & Case IH Loaders With Pin-On Loader Arms: 100TL, 110TL, 7106, 7108, 7308 & L130. Expect This Adapter & ALL Of The Equipment We Sell To Be Quality Equipment That Will Serve You Well For A Lifetime And Provide A Good Resale Value Too! This Adapter Will Attach To The Above Listed Ford/New Holland & Case IH Loaders with Pin-On Buckets. Everything Is Painted, Plated Or Anodized To Prevent Rust. Zinc Plated Or Anodized Moving Parts & Handles For Trouble Free Operation & Long Life! Plus We're Glad To Say This Adapter Is MADE IN THE USA! TYPICALLY IN STOCK, BUT YOU'RE WELCOME TO CHECK ON AVAILABILITY! The item "Ford/New Holland/Case IH Skid Steer Adapter 100TL, 110TL, 7106,7108,7308, L130" is in sale since Wednesday, March 6, 2019. This item is in the category "Business & Industrial\Heavy Equipment, Parts & Attachments\Heavy Equipment Attachments\Buckets".